Entrance to the The Macey Co. at 1516 S. Division. The Macey dry kiln in the foreground, factory in the background. 1892: Fred Macey begins selling furniture by mail order. 1896: the Fred Macey Furniture Co. is founded. 1905: Merges with Wernicke Furniture Co. to form Macey – Wernicke Co.
1908: Name is simplified to The Macey Co.
1916: Company goes into receivership but continues to operate, and eventually recovers. 1937: Company again files for bankruptcy. The Macey Furniture Co. was founded by Fred Macey, who served as its first chairman along with his brother Frank, who also served as treasurer. In 1892 Fred began a mail-order business selling office desks made by other manufacturers, which were advertised in popular magazine as “the best $25 roll-top office desk in the world.” His hefty advertising budget made the company a quick success, and other pieces of office and library furniture were soon added to the mail-order line. 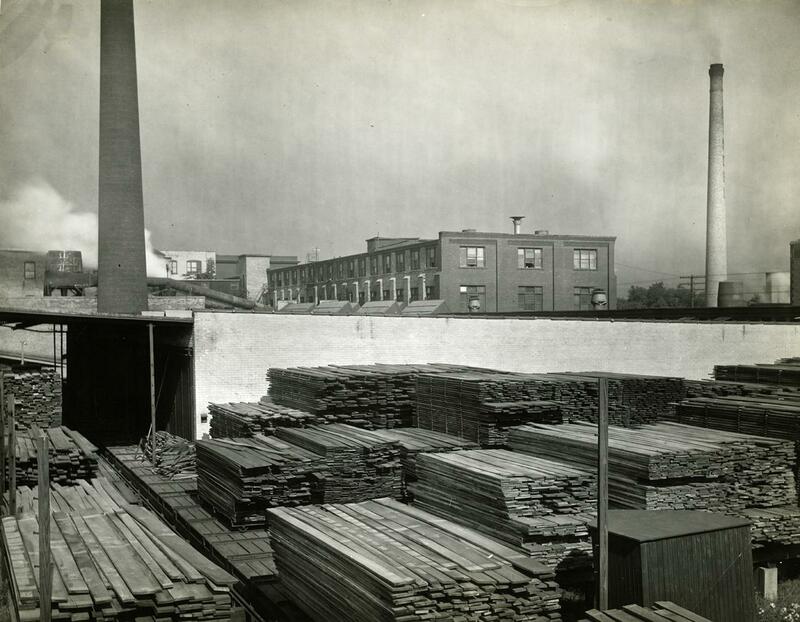 But as his mail-order sales began to cut into the traditional sales through retailers, Michigan retailers pressured area furniture manufacturers to prevent them from producing finished goods for Macey. To get around this obstacle, Fred Macey invested his mail-order profits in the construction of his own factory. He also expanded his mail-order business, with a national system of warehouses for distribution. In 1905, when the Wernicke Furniture Co. merged with the Fred Macey Co., Otto H.L. Wernicke became an officer of the company. In 1906 the Globe – Wernicke Co. of Cincinnati sued Macey for continuing to produce furniture using Wernicke’s patents. After years of litigation, Macey won, then counter-sued to recover its court costs. Following Fred Macey’s death from typhoid pneumonia in 1909, Otto Wernicke became company president, a position he held until his retirement from active involvement at Macey in 1916. In addition to roll-top desks, Macey’s early products also included oak card indexes and file systems, and sectional bookcases and filing cases. Lines were expanded to include wooden library tables, swivel chairs, “ladies’ desks,” music cabinets, Morris chairs, Turkish and Colonial rockers, and couches. Filing card supplies were also sold to use in the card filing cabinets. 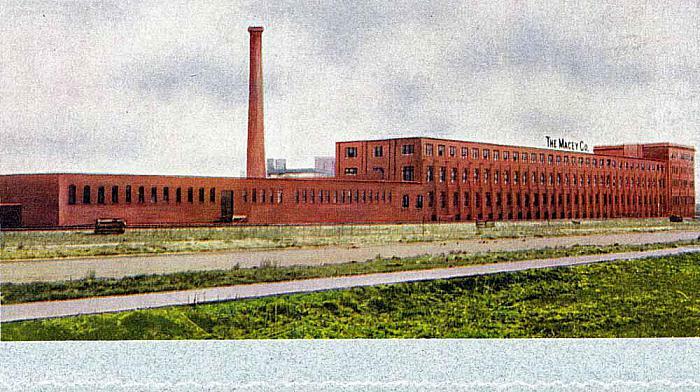 In 1912 the Metal Office Furniture Co. (later Steelcase), located next door to Macey’s plant, produced the first metal filing cases and safes to be sold through Macey outlets. These pieces were sold with the Macey name until 1918, but were distinguished from the wooden products with the name “Inter-Inter” Line. During the 1920s and ‘30s Macey produced wooden executive office suites in various period revival and even Art Deco styles. Pieces produced before 1908 may carry the name “Fred Macey Furniture Co.” or simply “Macey” in an italic script, with the tail of the let “Y” underlining much of the word. Pieces produced after 1908 will bear a modified version of the earlier mark, with “Macey” in simpler script, surrounded by a black or solid colored oval. Manufacturer of Otto H.L. Wernicke’s patented “elastic bookcases,” a system of wooden compartments that interlocked vertically and horizontally to create flexible cases for book and paper storage. Predecessor to The Macey Co.
1893: Company established in Minneapolis, Minnesota. 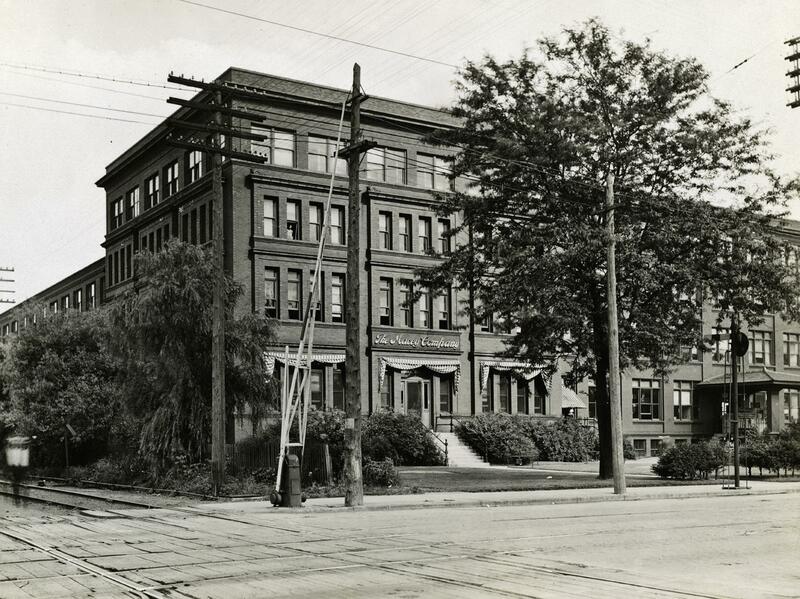 1897: Moves to Grand Rapids. 1904: O.H.L. Wernicke founds the Globe – Wernicke Co. in Cincinnati, Ohio. ca. 1905: Wernicke purchases Fred Macey Furniture Co.; name changes to Macey – Wernicke Co.
1907: Name simplified to The Macey Co.
Macey, Fred Co. Ltd., Macey, Fred Furniture Co.